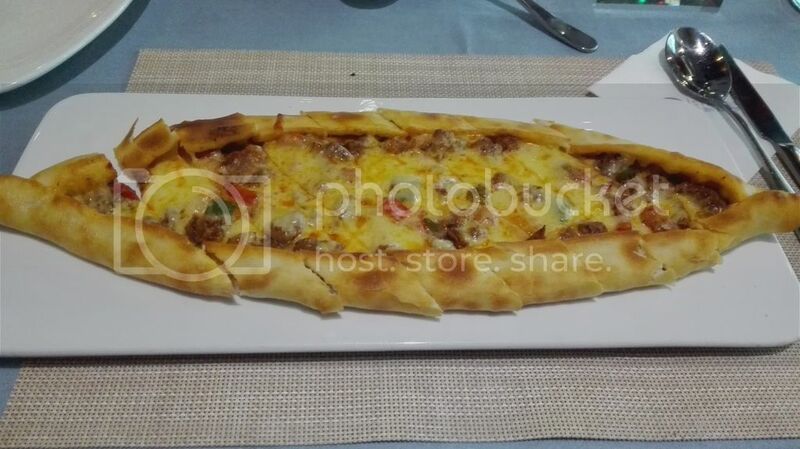 Istanbul Restuarant’s Slightly Oblong Pizza. Pizza is something I am passionate about. What can I say? I am from New Jersey, a surreal place where intense Facebook drama wars can, and have, broken out over this subject. Do you love Pizza Hut? Never say that in Jersey! You will likely get lengthy list of locally owned pizzerias in response. This list will also be given to you with a bunch of exasperated sighs and eye rolls. Add to this that I am half Italian-American, and the pizza I grew up eating was home cooked and made by my mother. And if you say anything is better than my mom’s cooking, I will fight you! Simply put, my standards for judging pizza quality are absurdly high — to the point where personal, cultural, and ethnic issues are all in play. Not to mention the memory of my late, dearly departed mother. The worst thing you can do, if you are sharing a pizza with me, is to ask what I think about it. You will get a lengthy, dramatic monologue, with footnotes. And digressions, too! Wild gesticulations might also be possible. After all, I might need to empatically prove a point. Your non-spoken response might be,:”This guy is a bit loony.” You wouldn’t be that far from the truth. We are only talking about pizza after all. And even despite all of this personal baggage, I can say I have eaten some of the best pizza in Changzhou, recently. For me, it also came from a surprising place: Istanbul Restaurant. I only have a passing knowledge of Turkish cuisine. Sure, I have eaten my share of Donor Kebabs and hummus, but I never knew the country had it’s own, unique heritage when it comes to pizza. So, Istanbul Restuarant’s pizza doesn’t share the circular shape of it’s Italian and Italian-American. You could say it’s in the shape of an eye, but one were the eyeball is yellow and filled with chunks of meat. Let’s set the surreality of that one side for a moment. The crust is thin, which is a relief. Most of the pizza you can find in China tends to be thick. And for a guy from Jersey, that’s just bad. Very bad. Pizza should not taste like bread with pizza toppings on it. The greatest thing though, is the beef donor kebab toppings. That was a first for me, and while the thought sounded alien at first. Actually eating it on a pizza seemed like an absolute no-brainer after the initial first bite. And so it comes to this: Istanbul Restaurant simply makes pizza you just cannot find anywhere else in Changzhou. Changzhou founding father Ji Zha at Wujin Who’s Who Museum. Also the guy in Real Changzhou’s Header image! Sometimes, museums can lack personality. Yes, you can get a sense of history from them, but sometimes it can feel that you’re just looking at a bunch of old stuff that doesn’t have a lot humanity connected to it. If you walk into the Wujin Museum or the Hutang Museum, you certainly get this. Essentially, you’re just looking at old ceramics and bits of sharpened metal. Do not misunderstand me; all historical relics deserve to be not only be protected, but put on public display. This teaches and celebrates history, but as stated earlier, museums can just feel like impersonal spaces filled with lit glass cases. The Wujin Who’s Who Museum (武进名人馆) lacks this impersonal atmosphere. Then again, you really can’t call it a museum, either. It’s more of a history-inspired art installation or exhibit. A visitor will not find a lot of relics here. They will, however, see a lot of statues surrounded by colorful displays depicting the nature of an individual life. These displays also feature explanatory text in both Chinese and English. This makes the Wujin Who’s Who Museum extremely foreigner friendly. It mirrors the intent and mission of the place: to convey Wujin’s unique cultural heritage to both visitors and locals. To this end, there is no admission fee. So, who will a visitor learn about, should they visit? The first display is devoted to Ji Zha, who is the cultural founding father of Changzhou in general. Both a scholar and a warrior, Ji Zha lived during the Spring and Autumn era of Chinese history. That’s roughly 2500 or so years ago. The nation of China had not totally coalesced yet, and the greater Changzhou area was once part of the Wu Kingdom. Ji Zha’s humility is a well remembered part of his legacy. He shunned power rather seeking it out. This exhibit is hardly the only place a visitor will find Ji Zha in Changzhou. He’s mentioned in the Changzhou Museum. There is a statue of him in Renmin Park downtown, as well a commemorative arch in Hongmei Park – also downtown. He is not the only historical figure to cross districts in Changzhou. The Wujin’s Who’s Who Museum also celebrates Qu Quibai, an important figure in the early history of the Chinese Communist Party. His former residence is preserved and open to visitors, but that’s in the Zhonglou part of downtown. Another part of the museum showcases a bust of Zhao Yuanren (English name Yuen Ren Chao). He was a famous linguist who immigrated to the America, became a naturalized U.S. citizen, and taught at Harvard University. Zhao was one of the first Chinese scholars who helped shape an English-reading audience’s understanding of Chinese language, dialects, and culture. He, for example, coined “stir fry” to explain what happens to both meat and vegetable once it enters a hot wok. The museum notes that he was born in Wujin, but his former residence can actually be found in Tianning. Other examples could be cited, but why explain everything? Though, one interesting thing remains. The late Ming and early Qing Dynasty painter Yun Nantian (aka Yun Shouping) has space devoted to him. Unlike the other cultural figures on display, he does not have a statue dedicated to him. A visitor instead sees examples of his art and calligraphy behind protective glass. This is one of the rare exceptions to the “this is not about relics” rule stated earlier. It’s particularly interesting, to this writer at least, because the two other Wujin sites associated with Yun Nantian are seemingly closed to the public. His former residence is relatively hard to find and delapidated, as is his well-maintained grave – which is actually in the middle of Wujin farmland and can only be traveled to over rough, narrow concrete pathways. As stated, a laundry list of culturally important people could be described here, but that defeats the purpose. Go visit this place and connect the dots for yourself! The Wujin Who’s Who Museum is located in Yancheng. This is the area also home to the Wujin Museum, a zoo, an amusement park, and much more. Specifically, it’s inside a recreation of on old Chinese barrier wall with a gate. Once passing through the central arch, a visitor will find the exhibit’s entrance with signage in both English and Chinese. The B1, B15, and B16 share a mid-road stations near the Yancheng historical sight / amusement park, and there is also a bus hub for several non-BRT lines. NOTE: This is an older post cross posted from my personal blog. Three vegetarian dishes with the obligatory rice to soak up the sauce! Recently, I took a very dear and very close friend to Kaffe. It’s an Indian Cafe near the Wujin TV Tower and Xintiandi Park. It’s easy to get to on the B11 BRT bus. The Indian guys that run the place are super friendly, and they have no problem reducing the spiciness level to your preference. Let’s just say that, once, I ate lamb vindaloo there had both sweat dripping from my face and tears pouring from my eyes. And I couldn’t stop eating! I never knew both intense, agonizing, and excruciating pain and deliciousness could coexist! Point: I have never had a bad meal there. And good restaurants are meant to be shared. More importantly, my friend is a vegetarian and new to Wujin, and I wanted to show her an eatery potentially friendly to her lifestyle choices. So, what did we eat? This is the point where I curse the flash on my Huawei phone’s camera. It renders food in a most unappetizing light — especially when it comes to saucy dishes. You can clearly see that in the above photo. Anyhow, back to the point. What did we eat? I chose to defer to my friend’s vegetarianism. While I currently eat meat, I once was a vegetarian for a large part of my life. Meat can always be foregone for the sake of pleasant company. And besides, part of me misses being moral certainty of being vegetarian. Besides, I enjoy vegetarian food anyway. So, onto the food…. There is one dish I can’t remember the Indian name for. It’s listed under “Snacks” and it’s chick peas, potatoes, and other vegetables with a drizzle of plain yogurt. In my mind, I have always called it “Indian Potato Salad.” Because, well, that’s what it is … a type of potato salad. 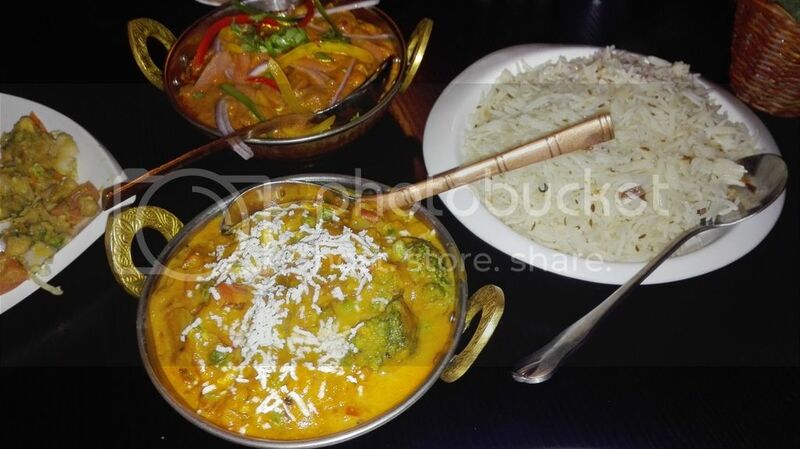 There was also mixed vegetable curry, but if your inclinations slant towards “vegan” this dish might not be for you. It has paneer in it; that is, dense, slightly sweet, cubes of Indian cheese. I didn’t know that when we ordered. The last thing we shared was chana masala — a delicious chickpea dish easily found in most Indian restaurants back in America..
You could say we ordered two thirds of all the vegetarian options available. Kaffe’s menu is not that vast, and that’s not a complaint. I’d rather a restaurant do a limited number of things well than dozens of things poorly. at Changzhou is a wasteland, either. There are some great public parks like Hongmei, Dongpo, and Jingchuan, but they are more recent creations. Many private gardens in Suzhou are also historical sites that have been around for at least two generations or more. I found such a place in downtown Changzhou, recently that dates from the Qing Dynasty. In fact, I have often passed by it since 2014 without even really knowing it was there. Yueyuan Garden (约园) is practically right on Jinling Road, and the north-bound 302 bus passes it before crossing over Yanling Road. It’s also easy to walk to from Nandajie. If you walk south on Jinling, pass Tartine Bakery, it’s actually one of the immediate turn offs. The garden itself is encircled by a circular road and some parking spaces and buildings belonging to Changzhou #2 People’s Hospital. The Garden has two pavilions. One sits atop gray and weathered rocks. The other is on an island in the middle of the pond. A concrete walkway with railings provides access. Besides sit – and possibly eat a takeout lunch – in peace and quiet there is not much else to do here. It is a realatively calm space where you hear the burbling of water more than Changzhou traffic. Changzhou’s foreigner population contains a high number of Germans. They tend to be engineers — logic dictates that they would not be English teachers. This demographic reality can be seen on high-priced restaurant menus meant to attract expats and their money. And by this, I do not mean Jeagerwirt or Chocolate’s in Wujin — both actually boast themselves as “German Restaurants.” Rightfully so, too. Both are great. I am talking more about the generally themed “foreign” eateries that want to be everything to everybody. Candles in Xinbei is such a place. Their menu tries to excite Australians, Americans, Brits, Germans, and more. This is a place often championed as “The Place” to hang out in Changzhou. And that’s true — but only if you live in Xinbei. The people who champion this place the as the greatest ever are people who live in Xinbei and think Wujin is a waste of time. I now live in Xinbei, and I can tell you that when it comes to German food, Candles is mediocre. It’s great, because, well, there is nothing else in the Xinbei district that competes. When you have nothing else, and you only have one option, mediocre is quite awesome. Think about it. What other choice do you have? You don’t. I thought about this, because I ate a Jeager Schnitzel at Candles for lunch, and it was nice. But. But! 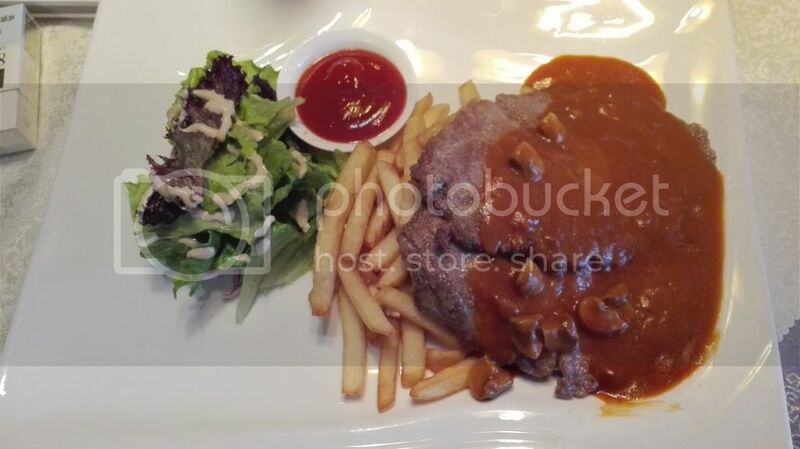 But, Jeagerwirt and Chocolate’s in Wujin do this particular dish much better. Please don’t assume this as “hating” on Candles. I would eat this again and eat it again at Candles. China can easily be divided between what is “developed” and what is “developing.” Let me put it this way. 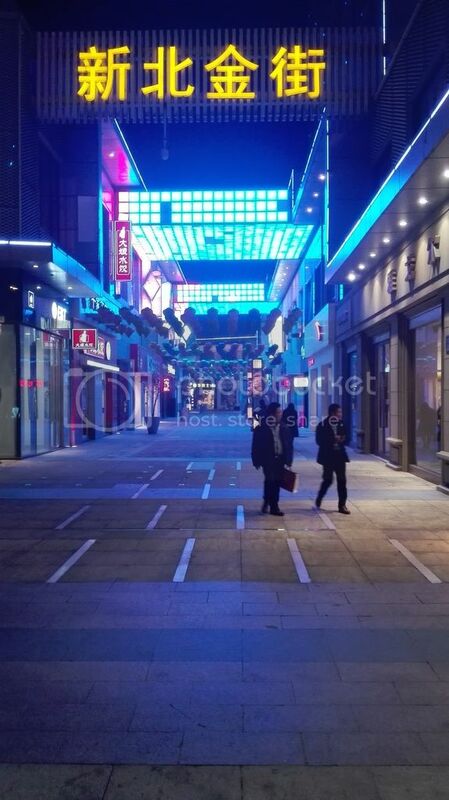 Changzhou is “developed, but still developing” and a plase like Yancheng is “developing.” Sometimes, that economic growth can be measured in what is being built: super malls. These places can be gargantuan — three to five floors. Quite often, you can find towers dedicated to office space or residential apartments. The highest-end mall tends to be Wanda. Some Chinese people I know gauge the growth of their cities by counting Starbucks. Some simply count how many Wanda Plazas there are in their city. After all, the Wanda Group is one the biggest real estate companies in China. Changzhou has two. One is in Wujin, and the other is in Xinbei. The Xinbei one is the older one. Both have IMAX theaters on the top most floors. (Case in point: I watched Star Wars: The Force Awakens at the Wujin Wanda’s big goddamned screen.) Wanda, even as a corporate group, has bought into American entertainment companies like AMC Theaters. The stores inside a Wanda are usually the same sort of chains. Think about it. Most American malls have JC Penny and Sears. Xinbei Wanda has a Starbucks, a McDonalds, a KFC, and much more. There are the regular mall floors, but there is also a pedestrian walking street with plenty of boutiques and eateries. 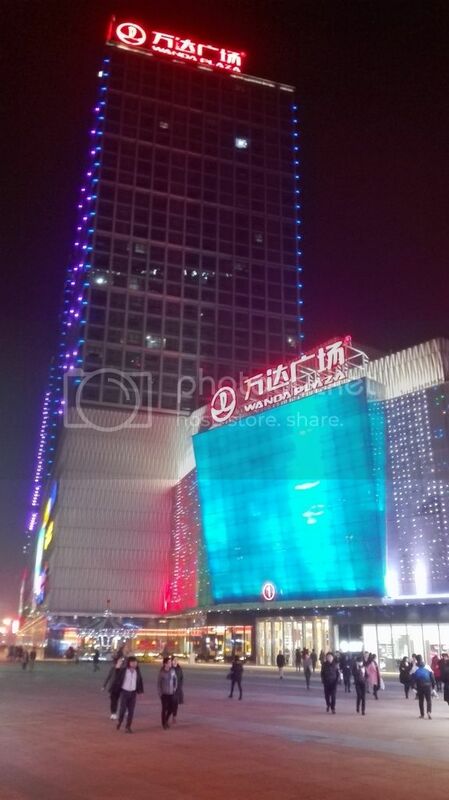 The Wanda in Xinbei also functions as the defacto dowtown for that district. It’s the commercial / retail hub for northern Changzhou. If the swanky restaurants are not located here, they are in relative walking distance.